Day 2 - Marrakech - Tiziane: In the morning we leave Marrakech in our private minibus. 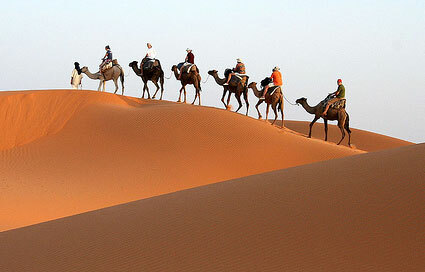 After admiring the Moroccan landscape awhile, we arrive at the point where our trek begins. There, we meet the mules and the cook who will make our life much easier these coming days! We cross the town of Imioughlad and begin the ascent towards the first mountain pass of the trek. From the pass, at 2000m above sea level, we have precious views of the region of Tigouga, Taroudant, and of the Angour mountains to the north. After lunch, we arrive at the village of Tiziane and set up camp. 4hr30min walk. Day 3 - Tiziane - Tizgi: We start the day early to avoid the sun during the ascent of a mountain pass. After reaching the Teouti pass, at 2400m, we descend towards the town of Assaka. After lunch, our path climbs again until we reach the village of Tizgi, where we set up camp. 6hr walk. Day 4 - Tizgi - Azib Tamsoult: Today we hike along beautiful, wild, landscapes of the Toubkal range. We'll find flocks of cattle with their Berber shepherds. After the morning ascent, we descend to the valley of the river Azaden, where we eat. With renewed strength, in the evening we climb to the campsite of Azib Tamsoult, at 2250m. 6hr walk. Day 5 - Azib Tamsoult - Toubkal base camp: Today is an intense day, in which we significantly increase the average altitude of the trek. 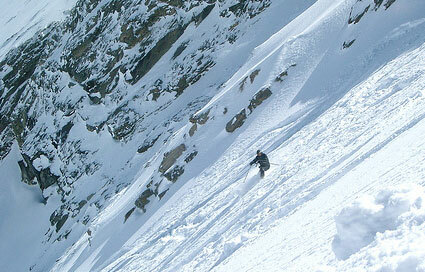 Ahead of us we have the demanding ascent to the Aguelzim pass, at 3450m. The ascent is long but progressive. 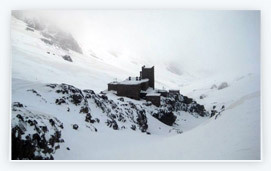 Once on the pass we will be able to admire the summit of Toubkal. We then descend towards the Toubkal base camp, at 3200m. 6hr30min walk. Day 6 - Ascent of the Toubkal: Today is D-Day. With four days of walking in the Toubkal National Park, the possibilities we have of successfully reaching the summit are high. We start the day early, at daybreak, to avoid the sun as much as possible during the ascent. After 3 hours of effort, we reach the top of North Africa. All the effort pays off with the impressive views we have. After enjoying this moment, we start the descent to the base camp. There we eat and then continue the descent towards the Village of Imlil, where we spent the night. 7hr30min walk. 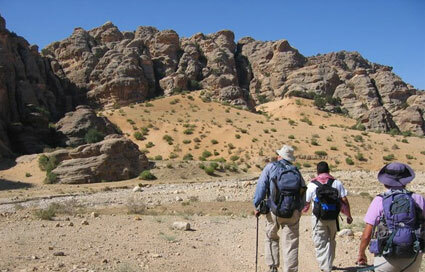 Day 7 Hiking along Berber villages: Today we have a "relaxed" hike through several Berber villages. We climb a pass and then we walk along the beautiful valley of Imenane. In the evening we head to Marrakech. 5hr walk. Day 8 : Transfer to airport.